Dark days have come to the lands of Qaarra. A billowing cloud of smoke and soot, the legacy of the doom that wracked the Iron Isle nearly a year ago, creeps south, spreading foulness and chaos across the landscape. In Vildeburg, the grimy jewel of Qarraa and the greatest city for a thousand leagues in any direction, the elders meet to discuss this ill portent. What does it mean for their fragile bastion of civilization? In their mountain fastness Stonehill near the coast, the dwarves look to the horizon with stolid determination, knowing that their way of life is about to change. In the verdant forests, the elves gird themselves with ancient armor and powerful magic, ready to fight for their future on Qaarra. In the dusty, windswept wastes of the Agamin desert, Lord Kalessin inclines his ghastly visage to the west and regards the doom-cloud on the horizon. A dry cackle escapes from his ruined throat. For centuries, he has been awaiting a sign -- and now it has arrived. Elsewhere, villagers, knights, warriors, heroes and rapscallions all feel the coming tumult. Some choose to flee, and soon the wilderness roads are thick with families on the move. Brigands and raiders take to the hills, preying on these unwary travelers. Feral creatures and foul monsters lurk in the dark hills. Upheaval and chaos seems poised to engulf Qaarra. As the doom-cloud dims the sun, mercenaries, barbarians and adventurers sweep through the borderlands. They are met by unlikely groups of heroes and warriors determined to protect their homeland. Alliances will shatter, only to be reborn again in the fires of battle. Session 6 - The Dead Rise! CSW is about to embark on its second annual summer fantasy campaign, set in the same world as last year's Iron Isle campaign. Indeed, the campaign begins a little less than a year after the Iron Isle was consumed by a massive volcanic explosion. Now, a phenomenon called the doom-cloud, imbued with the dark magicks that were unleashed on the Iron Isle, is creeping south and east, threatening the peaceful lands of Qaarra. 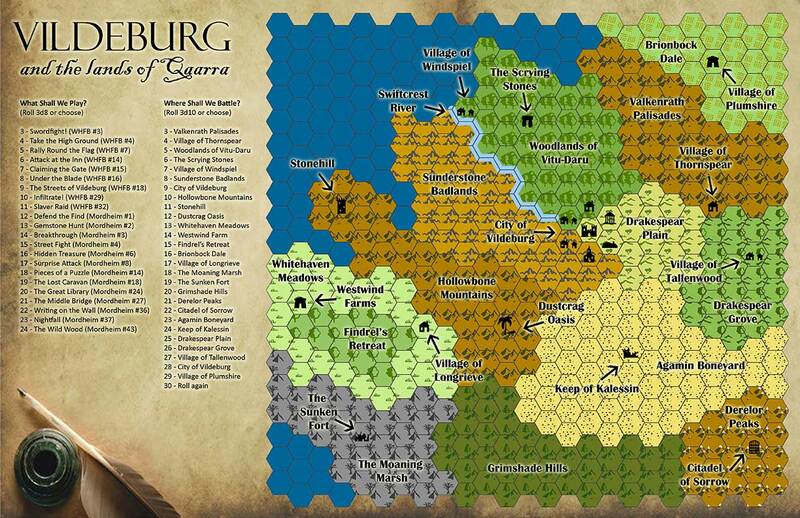 Unlike the isle, which was mostly deserted except for the skirmishing warbands, the lands of Qaarra are populated by farms, villages and even a city (Vildeburg).We hope to represent this in our scenarios. We'll be using Song of Blades & Heroes for most campaign games, same as last year, though we've pledged to try out some larger engagements using WarEngine or Kings of War (both free, rules-lite rulesets for playing with 40+ figures per side). As before, we expect to play lots of games over the next few months and post plenty of battle reports to our blog. We've been very busy painting and modeling in anticipation of this campaign, so stay tuned!